San Antonio - Late Thursday afternoon, the Texas League Office announced its 2018 Post-Season All-Star Team. Headlining the Missions' selections are shortstop Fernando Tatis Jr. and pitcher Logan Allen. In 88 games this season, Tatis Jr. batted .286 (101-for-353) with 22 doubles, four triples, 16 homers, 43 RBI, 77 runs scored and 16 steals. At the time of his season-ending thumb injury on July 19, Tatis Jr. was leading the Texas League in runs and total bases (179), while ranking second in extra-base hits (42). After a slow start to his 2018 campaign, the talented infielder caught fire in May, batting .336 (41-for-122) with seven homers and 16 RBI in being named Texas League Player of the Month. Tatis Jr., who is the No. 2 prospect in all of baseball according to MLB.com, finished his season sixth in the league in SLG (.507) and tied for sixth in hits. It's been an eventful two days for Logan Allen, who on Wednesday was named the league's Pitcher of the Year. In 20 games (19 starts) this season for San Antonio, Allen went 10-6 with a 2.75 ERA and 125 strikeouts against just 38 walks over 121 innings. The Fletcher, NC native punched out a season-best 12 in the club's 8-5 win at Midland on May 20. 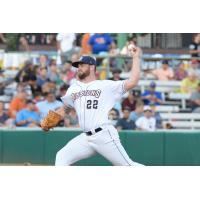 Two starts later, Allen combined with reliever Jason Jester on the club's 13th no-hitter in franchise history as San Antonio blanked Tulsa 6-0 on May 31 at ONEOK Field. 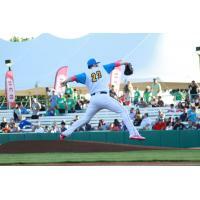 At the time of his promotion to Triple-A El Paso, Allen was leading the Texas League in wins, ERA, strikeouts, WHIP (1.05) and OPP AVG (.205). Allen was also second in innings pitched. Naylor has been a consistent force in the Missions' lineup all season, leading the club in hits, walks (62) and OBP (.384). In 123 games, Naylor is hitting .298 (144-for-484) with 22 doubles, one triple, 16 homers, 71 RBI and 70 runs scored. San Diego's No. 15 prospect (according to MLB.com) enters Thursday second in TL in hits, third in OBP and fifth in both AVG and total bases (216). Austin Allen's name is also seen throughout the Texas League leaderboard. The catcher leads the TL in both SLG (.508) and total bases (223), while tying for the league lead with Midland's Seth Brown in extra-base hits (52). 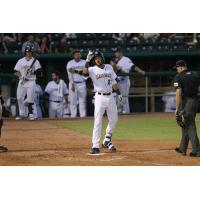 Allen, who earned Texas League Player of the Month in April, is fifth in the TL in homers with 22. All four Missions selected to the Post-Season All-Star Team were also Mid-Season All-Stars. San Antonio (28-35, 70-63) resumes its four-game series in Midland (30-35, 63-71) Thursday at 7:00 PM.